ALCOLOCK is committed to offering top-quality products that we develop ourselves. We aren’t satisfied with offering a single device or reselling an existing line of products. Instead, we are committed to immersing ourselves in the industry. Over the years, we’ve grown to become recognized experts in our field. We remain at the top of the industry by developing best-in-class products that span the entire gamut, from lab equipment to devices that aid program facilitators to the breathalyzers and products the consumer uses throughout their program. Alcohol Reference Solution is one of the quality products we offer to help make the road to license reinstatement and independence as easy as possible for everyone involved. Alcohol Reference Solution (ARS) is an ethyl alcohol standard that assists in calibrating your equipment. It allows you to accurately calibrate your IID or breathalyzer sensor when used in combination with the ALCOLISM breath alcohol simulator. You can use the Alcohol Reference Solution whether you’re calibrating a device for a client or calibrating your own device. Regularly calibrating your device can help to prolong its lifespan and accuracy. Our Alcohol Reference Solution uses only USP grade ethyl alcohol solution in order to provide you the highest quality and most accurate results. We ensure that every batch of reference solution is analyzed by gas chromatography so that the results are traceable, which ensures accurate calibration. The following specifications also apply. Combine the ALCOLOCK Alcohol Reference Solution with your ALCOLISM breath alcohol simulator. By using the solution with the simulator, you’re able to generate a breath-like sample with the correct concentration necessary to calibrate your device. After calibration, you’re able to use your device as usual to provide a breath sample and test as you typically would. 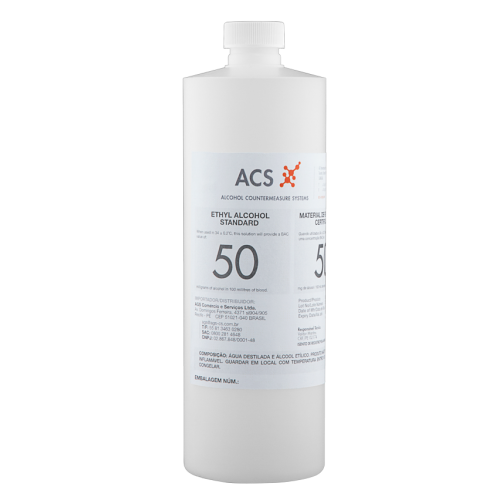 ALCOLOCK’s Alcohol Reference Solution is just one of our many accessories and products. Whether you’re a driver looking for ways to more efficiently complete your program or a facilitator seeking to expand upon your existing line of product offerings to better serve your client base, we have many options that can help you reach your goals. Check out our shop for more outstanding products and services developed to help you succeed. We use USP grade ethyl alcohol solution because we want to provide you the best quality. We make sure each of our alcohol reference solution batches are analyzed by gas chromatography and are traceable to ensure accurate calibration. 38 mg/mL, 0.02%, 0.03%, 0.04%, 0.05%, 0.08%, 0.10%, 0.11%, 0.15%, 0.20% and 0.40% concentrations are available for various calibration requirements. To ensure your safety, each bottle is made of high-density polyethylene and sealed with a poly seal cap.